I had the privilege of being recruited by Jacques and I have the pleasure to say that Jacques is the best recruiter that I ever met. During the recruitment process Jacques has demonstrated to have a great care towards my profile and was always able to guide me in all my queries and doubts with a highly effective/proactive verbal communication skill never seen before. Jacques has the skill to communicate in a clear way, and in a manner that promotes a vision of success. He is also a key recruiter, negotiator and understands the real job needs and always follow my case and provide me constant feedback. He consistently supported me and provided me with resources to ensure that I was prepared for all my interviews. I highly recommend Jacques as a recruiter and I would like also to Thank him for finding my current role but most of all for all his hard work and support. Whitney has been one of the most positive, energetic recruitment consultants I've had the pleasure to work with. Her enthusiasm for her clients is contagious and bubbles through all she does. Her attention to detail, client follow up and ability to build a strong rapport are testament to her professionalism and passion for what she does, ensuring the transition to securing a new position is seamless and stress free. It's been a pleasure to work with her in securing the perfect job! From the initial contact through to my first day in my new role as a Release Manager, I knew that I was dealing with an experienced and professional recruitment consultant. Jacques approach and manner, both written and verbal is clear, concise, responsive and equally important, is friendly. Throughout the recruitment process, I was kept fully informed through emails, texts and phone calls, was offered guidance and advice throughout with Jacques fully managing and coordinating all of the engagement between the client and myself. 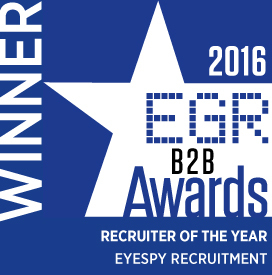 I would certainly recommend using Jacques and he is a credit to EyeSpy Recruitment. Whitney had an extremely professional approach when handling my recruitment, and she took time to match my credentials with the most suitable roles. This is what you would expect a top notch recruiter to be all about, and I applaud her for doing this better than the rest. Thanks to you Whitney, I have the absolute perfect job. Keep on shining and working hard! Emily is without a doubt the best recruiter I have ever worked with. From the moment we first spoke about a potential role, through to the offer and relocation, Emily has been an absolute godsend. She understands the companies and the roles she's recruiting for inside out, put me at ease by making sure I was totally prepared for my interviews. The thought of international relocation, however exciting it seems, is actually very daunting but with Emily, it's so simple that you have nothing to worry about other than what date you'll actually fly on! In competitive industries, it takes someone special to stand-out - Jo does this brilliantly (and makes it seem so effortless too!). She really took the time to understand my personal and professional goals & guided me through quite a complex recruitment and relocation process. I highly recommend Jo to any individual or organization looking for a recruitment partner.